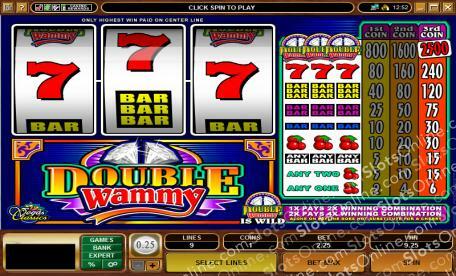 The Double Wammy slots are part of the Vegas Classics range of Microgaming slots. Click here to play! That's why when you play these slots you know just what to expect: a 3-reel game with a single payline and a generous jackpot prize. When you play 3 coins on these slots and see three Double Wammy diamonds land on the payline, you can bet that your car repayments are going to be a little bit easier in the near future. As its such a classic slots style, the Double Wammy slots feature many classic symbols other than the Double Wammy wild symbol that triggers the jackpot. Red cherries that payout whenever one lands on the payline, the usual selection of BAR symbols, and lucky red 7s are all featured in this slots game. With the pay table always onscreen, you'll see wins lining up as each reel stops, adding to the excitement of the game. For a great time playing a solid slots game with a familiar theme, be sure to spend some time with the Double Wammy slots on your next visit to an online casino. The Double Wammy Logo symbol is wild and substitutes for any other symbol. Also, the payouts of winning combinations are increased when they use a substitute. When 1 wild symbol substitutes, the prize is doubled. When 2 wild symbols substitute, the prize is increased a whopping 4 times.